Home / vScope Billing / What Are Price Items/Groups/Categories? There are three main concepts of prices in vScope Billing: Price items, Price groups and Price categories. The easiest way to visualize their purpose is to look in the Browse Billing Account View. All prices in vScope are entered as MONTHLY prices. These are individual prices that define the prices of resources or attributes of a resource. Price item #2: CPU = $10/pc. Price item #3: User account = $50/pc. You may add any number of conditions to a Price item to define when a price should be calculated. 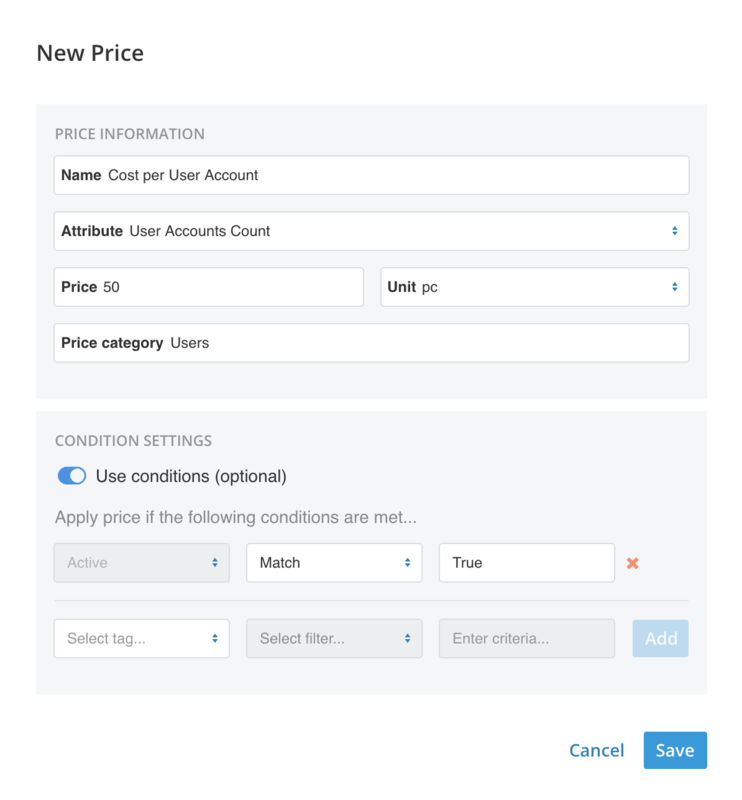 You can use this to for instance only count prices only for user accounts that are active. Using Price groups allows you to group one or several Price items. This is very convenient when you want to aggregate Price items into one single price. As for Price items you may add conditions to your Price groups. A good example here is when you want to calculate the price for a ‘Windows Machine’ or a ‘Gold Level Server’. If you want to add a price for Windows Machines it might be a good idea to add the condition OS = *Windows*. This will have vScope Billing only calculating Price groups where the Operating system actually is Windows. This will result in counting of RAM and CPU prices on all Windows machines that are Running. You may also (optional) add a price to your Price group. You can think of that as a “starting price” or a “base price” for any given Price group. Eg. A Windows Server always costs $100 no matter if it is running or not. A Price category cannot have any actual price. It is instead used to categorize and summarize costs in a Billing Summary. For instance if I want to aggregate all prices related to Servers (eg. Windows Server, Linux Servers, RAM) under one category. Price categories are created when creating a Price item or a Price group.